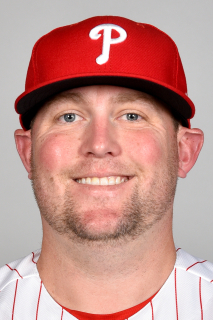 Full name is Drew Patrick Storen…resides in Carmel, Ind., during the offseason ... Graduated from Brownsburg (Ind.) High School in 2007…posted a 30-2 record and a 1.55 ERA during his high school career…named a Louisville Slugger All- American as a senior, while he was selected first-team all-state as a junior and as a senior ... Attended Stanford University, where he was a first-team All-America selection by Collegiate Baseball and Louisville Slugger as a freshman and was named All-Pac 10 twice…posted a 12-4 career record with a 3.64 ERA and 15 saves in 59 games, including a 3-0 mark and two saves in the Cardinals' run to the College World Series in 2008 ... Selected in the 34th round by the New York Yankees in the 2007 First-Year Player Draft, but opted to attend Stanford instead ... Father, Mark, is a long-time media personality in the Indianapolis area and has hosted a show on SiriusXM's MLB Network Radio. Did not pitch after undergoing Tommy John surgery on Sept. 26, 2017. In his first season with the Reds made 58 relief apps before his season ended after 1 outing in September...on 9/26 had "Tommy John" surgery to repair the torn ulnar collateral ligament in his right elbow...made his final appearance on 9/1 at Pit (26 pitches)...on 9/12 went on the 10-day disabled list with the elbow injury and didn't pitch again the rest of the season...was transferred to the 60-day disabled list on 9/17, when the Reds claimed off waivers from the White Sox corner infielder D.J. Peterson...twice in a span of 3 apps from 8/14-8/20 allowed a career-high 6 runs, raising his season ERA from 3.23 to 4.71, but then allowed just 1 run in his last 5 apps (5ip) to drop his season-ending ERA back down to 4.45...8 times pitched on consecutive days...7 times in his career pitched on 3 consecutive days, most recently from 5/28-5/30, 2016 for Tor vs Bos, Bos and NYY...in the 7-4 win on 4/6 vs Phi earned his 99th career save, his only save of the season...in the ninth inning on 4/18 vs Bal became the fourth Reds pitcher to throw an "immaculate inning," recording all 3 outs by strikeout on 9 pitches (Hod Eller 1917, Rob Dibble 1989, Carlos Contreras 2014)...Storen used the same baseball for all 9 pitches...on 5/8 vs NYY became the first Reds pitcher to hit 3 batters in the same inning (7th) since Raul Sanchez hit 3 Phillies on 5/15/1960/g1 (8th)...retired the first batter in 41 of his 58 relief apps...stranded 5 of his 10 inherited baserunners...converted 1 of 3 save opps...the Reds went 22-36 in games in which he pitched. In 57 relief apps for the Blue Jays and Mariners combined to finish 4-3, 5.23 with 3 saves in 4 opps (51.2ip, 56h, 13bb, 48k, 7hr)...in January was traded from Wsh to Tor for OF Ben Revere and a player to be named...on 7/24 was designated for assignment by the Jays, and 2 days later was traded to the Mariners for RHP Joaquin Benoit...posted a 10.13 ERA in 10 apps in April (8ip, 9er) and then a 4.33 ERA in his last 47 apps of the season...in his Mariners debut on 7/27 at Pit allowed 4 earned runs in 1.1 innings, then recorded a 1.59 ERA in his last 18 apps of the year...earned his 3 saves, all for the Blue Jays, in a 4-3 win at Bos on 4/18, a 5-2 win vs LAD on 5/6 and 4-2 win vs NYY on 5/30...his 3-game winning streak from 8/6-9/26, covering 12 apps (3-0, 2.08), was the longest of his career...in August spent time on Sea's disabled list with right shoulder inflammation...following the season became a free agent...on 1/3/17 was signed by the Reds to a 1-year contract through the 2017 season. Posted 27 saves in the season's first half, ranking 3rd in MLB. Transitioned to set-up role after July 28 acquisition of RHP Jonathan Papelbon... Posted a 0-2 record with a 9.22 ERA after July 28. Converted 29 of 31 save opportunities and posted a 1.64 ERA (7 ER/38.1 IP) in 40 appearances through the end of July. Posted career marks in strikeout percentage (29.4%), strikeouts/9.0 IP (10.96), and his second-best swing & miss percentage (28.6 %). Suffered a broken right thumb in early September, causing him to miss the final three weeks of the season. Began 2014 pitching in seventh inning, but by season's end, reclaimed closer role (specifically with 1-2-3 9th/save on Sept. 7 vs. Philadelphia)...Went 2-1 with 11 saves, 20 holds and a 1.12 ERA in 65 appearances out of the bullpen...At 1.12, led all National League qualified relievers and posted the lowest single-season ERA by a Nationals reliever (min. 40 apps)...Bested C.Cordero's former mark (1.82 in 2005)...Threw seven pitches, all strikes, in a 1-2-3 ninth to earn seventh save & close out Nationals' NL East -clinching 3-0 victory, Sept. 16 at Atlanta...From Aug. 7 to seasons end, did not allow an earned run in 20.0 IP spanning 23 appearances...Converted 10 of 11 saves, six holds and held opposing batters to a .194 average over that two-month stretch. Pitching primarily in middle relief, made mid-season mechanical adjustment to pitching motion, yet tied for 7th in NL with 24 holds (one more than career total entering 2013 campaign)...was optioned to Syracuse, July 26...was recalled on Aug.15 and posted 10 holds and a 1.40 ERA in 21 appearances thereafter...earned 3 saves, all on the road: Aug. 22 at CHI (W5-4), June 28 at NYM (W6-4) and May 17 at SDP (W6-5)...induced a career-high 8 GIDP...struggled with highest BABIP mark (.324) of career, but K/9 (8.5), BB/9 (2.8) and SO/BB (3.1) ratios were all in line with career norms (8.4, 2.8, 3.0/1 entering 2013). Missed season's first 89 games after having bone chips removed from right elbow by Dr. Wiemi Douoguih on April 11 in DC...upon return, spent majority of season in setup role...notched 10 holds...worked scoreless relief in 33 of 37 appearances and allowed only 2 extra-base hits (2 doubles) in 30.1 innings...shifted into closer's role late and closed out 3 of Washington's final 10 wins...dating to '11, hasn't allowed a homer in 43.0 innings...posted a 0.86 ERA in 23 appearances from Aug. 17 through season's end. Dominated in sophomore season, going 6-3 with 3 holds, 43 saves and 2.75 ERA in 73 appearances ... ranked among NL relievers with 43 saves (tied 4th), six wins (tied 5th) and 89.6 save percentage (tied 6th) ... with 43, became just 2nd Nationals closer to reach 40-save plateau, joining Chad Cordero (47 saves in '05) ... became just the third pitcher in Nationals/Expos franchise history to record 43 or more saves, joining Cordero (47 in '05) and John Wetteland (43 in '93) ... reached 40-save mark with scoreless 9th in 3-0 win, Sept. 20 at PHI ... notched 43rd save on final day of season, Sept. 28 at FLA ... pitched best with game on the line, registering a 1.61 ERA in 48 save opportunities ... converted four of five save opps when asked to pitch more than 1.0 inning ... posted season-high 21.0 consecutive scoreless innings, April 7-May 16 ... from June 11-14, notched the save in each of Washington's four consecutive wins, becoming just the second Nationals closer to post four saves in four games (Mike MacDougal, Aug. 2-5, 2009). Reached the big leagues less than one year after being drafted and turned in solid results in 4-plus months with theNationals...with MLB debut on May 18 at STL, became the 2nd player from the 2009 First-Year Draft class to reach thebig leagues...was beat to the punch by only CIN's Mike Leake...posted Nationals' rookie-record 5 saves, and sufferedjust 2 blown saves...10 holds ranked 3rd among Nationals, 5th among MLB rookie pitchers...successfully stranded85.2 percent of inherited baserunners (23 of 27)...ranked among NL rookies in strikeouts (4th, 52), strikeouts per 9.0innings (5th, 8.5), strikeout-to-walk ratio (5th, 2.4/1), holds (5th, 10), batting average against (5th, .241) and appearances(tied 5th, 54)...in 2nd MLB appearance, May 19 vs. NYM, escaped inherited jam with 0.2 scoreless inning andwas rewarded with the win in Washington's 5-3 victory...tossed 1.2 scoreless innings, May 23 vs. BAL, to garner firstbig league hold...scoreless 9th rendered first big league save in a 6-3 win, Aug. 6 at LAD...earned spot in Washingtonby registering 4 saves and a 1.08 ERA in 13 minor-league appearances with Syracuse and Harrisburg. Professional: Combined to go 2-1 with 11 saves and a 1.95 ERA in 28 appearances with Double-A Harrisburg, Single-APotomac and Single-A Hagerstown...in first 19.0 innings as a pro, struck out 33 and did not issue a walk...first free passwas not issued until pitching for Potomac on July 30 vs. Winston-Salem...led Harrisburg in saves...was named co-Pitcherof the Month for Harrisburg in August...participated in the Nationals Instructional League program and subsequentlywent 2-0 with 4 saves and a 0.66 ERA in 12 appearances with Phoenix in the prestigious Arizona Fall League. Stanford: One of college baseball's premier closers in 2nd and final season at Stanford...First-Team All-Pac 10 selectionafter going 7-1 with 7 saves and a 3.80 ERA in 28 appearances...in 42.2 innings of relief work, tallied 66 strikeouts(13.9 K's per 9.0 innings) with only 8 walks en route to an 8.3/1 strikeout-to-walk ratio...paced the Cardinal pitchingstaff in wins, saves, ERA and appearances...became the first pitcher to lead the Cardinal in both wins and saves sinceformer big league LHP Jeff Ballard did so in '84...posted a .210 batting average against, including a meager .182 markwhen facing right-handed batters...struck out at least 5 batters on 5 occasions, including a career-high 8-K effort in 2.2innings of relief on May 23 vs. Oregon State. February 15, 2019 Kansas City Royals signed free agent RHP Drew Storen to a minor league contract and invited him to spring training. November 2, 2017 RHP Drew Storen elected free agency. September 17, 2017 Cincinnati Reds transferred RHP Drew Storen from the 10-day disabled list to the 60-day disabled list. Right elbow sprain. September 13, 2017 Cincinnati Reds placed RHP Drew Storen on the 10-day disabled list retroactive to September 10, 2017. Right elbow sprain. January 3, 2017 Cincinnati Reds signed free agent RHP Drew Storen. November 3, 2016 RHP Drew Storen elected free agency. September 4, 2016 Seattle Mariners activated RHP Drew Storen from the 15-day disabled list. September 2, 2016 Seattle Mariners sent RHP Drew Storen on a rehab assignment to Tacoma Rainiers. August 22, 2016 Seattle Mariners placed RHP Drew Storen on the 15-day disabled list retroactive to August 20, 2016. Right shoulder inflamation. July 26, 2016 Toronto Blue Jays traded RHP Drew Storen and cash to Seattle Mariners for RHP Joaquin Benoit. July 24, 2016 Toronto Blue Jays designated RHP Drew Storen for assignment. January 8, 2016 Toronto Blue Jays traded Player To Be Named Later and LF Ben Revere to Washington Nationals for cash and RHP Drew Storen. August 15, 2013 Washington Nationals recalled RHP Drew Storen from Syracuse Chiefs. July 27, 2013 Washington Nationals optioned Drew Storen to Syracuse Chiefs. July 19, 2012 Drew Storen roster status changed by Washington Nationals. July 17, 2012 Harrisburg Senators sent RHP Drew Storen on a rehab assignment to Potomac Nationals. July 15, 2012 Drew Storen assigned to Harrisburg Senators from Potomac Nationals. July 5, 2012 Drew Storen assigned to Potomac Nationals. June 3, 2012 Washington Nationals transferred RHP Drew Storen from the 15-day disabled list to the 60-day disabled list. May 17, 2010 Washington Nationals selected the contract of RHP Drew Storen from Syracuse Chiefs. April 30, 2010 Drew Storen assigned to Syracuse Chiefs from Harrisburg Senators. January 25, 2010 Washington Nationals invited non-roster RHP Drew Storen to spring training. December 1, 2009 Phoenix Desert Dogs placed RHP Drew Storen on the reserve list. August 11, 2009 Drew Storen assigned to Harrisburg Senators from Potomac Nationals. July 20, 2009 Drew Storen assigned to Potomac Nationals from Hagerstown Suns. June 11, 2009 Drew Storen assigned to Hagerstown Suns from Washington Nationals. June 10, 2009 Washington Nationals signed RHP Drew Storen.